The Commission on Elections on Friday said the plebiscite for the ratification of the Bangsamoro Organic Law will be conducted on two separate days. In a statement, the poll body said the plebiscite will be held on Jan. 21, 2019 and Feb. 6, 2019. 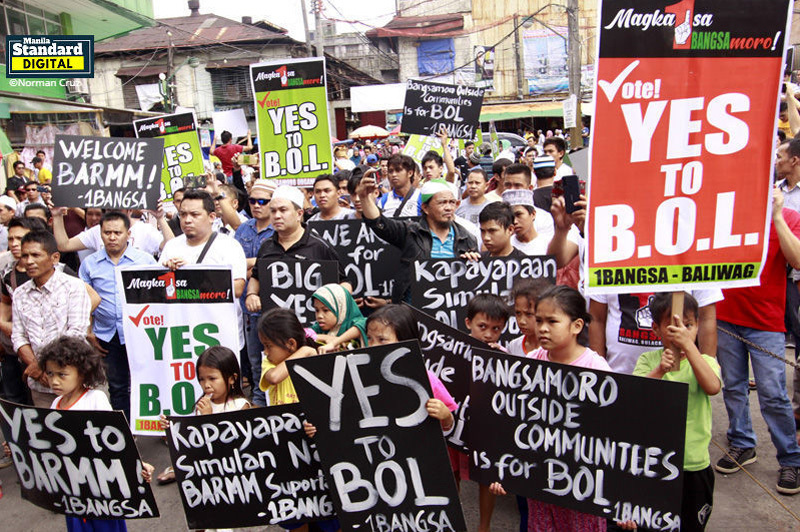 “The plebiscite for the ratification of the Bangsamoro Organic Law [BOL] will be conducted on two separate days to allow time for the full resolution of petitions for voluntary inclusion in the plebiscite,” the Comelec said in a statement. The plebiscite scheduled for January would be held for the geographical areas comprising the Autonomous Region in Muslim Mindanao, including Isabela City in Basilan, and Cotabato City. The February plebiscite, on the other hand, will be for the province of Lanao del Norte, except Iligan City; the municipalities of Aleosan, Carmen, Kabacan, Midsayap, Pikit, and Pigkawayan in the province of North Cotabato; and all other areas contiguous to any of the Bangsamoro core areas where: (a) the local government of such area, by way of a resolution, asked for inclusion in the plebiscite; or (b) at least 10 percent of the registered voters in a local government unit, by way of a petition, asked for inclusion in the plebiscite. The poll body said there are currently 99 pending petitions for inclusion in the Bangsamoro Autonomous Region in Muslim Mindanao. Comelec spokesperson James Jimenez said the Commission en banc decided to hold the plebiscite on two dates since they cannot meet the cut-off date which is Dec. 15 to rule on the petitions filed before them. “What happened is there were many petitions filed. So, mukhang hindi aabot doon sa cut off natin which is Dec. 15 also mukhang hindi aabot ‘yung resolution ng iba’t ibang mga petition,” he said in an earlier interview. The budget for the plebiscite is P857 million. Based on the proposed BARMM, being eyed for inclusion are the current provinces under the Autonomous Region in Muslim Mindanao, which are Basilan, Lanao del Sur, Maguindanao, Sulu, and Tawi-Tawi. Also eyed for inclusion in the would-be region are 39 barangays in North Cotabato, six municipalities in Lanao del Norte, and the cities of Cotabato in Maguindanao, and Isabela in Basilan.